Berwick Upon Tweed is England's most northerly town, sitting midway between Edinburgh and Newcastle at the mouth of the River Tweed. This spectacular Elizabethan walled town with its thrilling and turbulent military history guards the river estuary and, with its stunning seascapes, golden beaches and close proximity to some of the most evocative historical sites in the United Kingdom, provides the perfect mix for a rewarding visit.At the north end of the Town centre adjacent to the joint Railway/Bus travel hub sits the Castle Hotel. Evolving from three separate Inns in the historical past the Hotel is a place of welcoming simplicity epitomised by its most recent incarnation as an Art Deco venue in the mid-nineteen twenties. Our aim is to provide our guests with the comfortable accommodation and surroundings necessary to enjoy this beautiful part of the country with a great selection of quality food and drink to enhance the experience.Among many renowned visitors to the town to enjoy the Castle Hotel was the artist L. S. Lowry, a regular guest. Unfortunately we have not unearthed an unknown masterpiece on the premises but the Lowry Trail depicting the sites of some of his most famous paintings of the locality is a fascinating treasure in its own right. In more recent times the Hotel has been graced by the company of Eric Lomax, The Railway Man, especially at his reunions in the Bar with his old comrades on Remembrance Sunday. 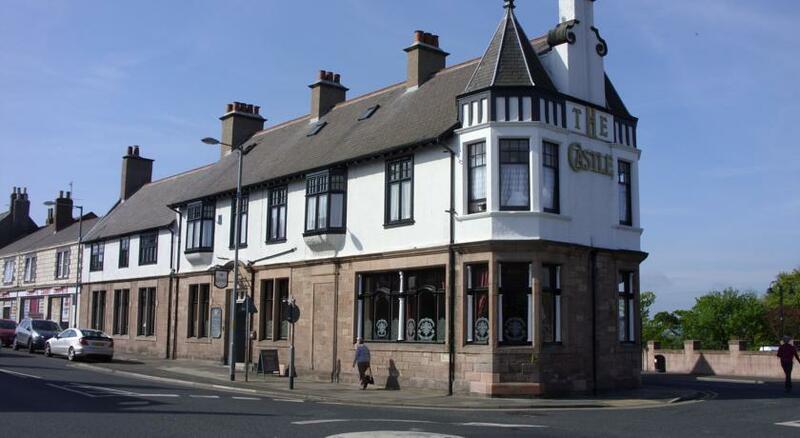 He will be sadly missed at future gatherings.The Castle Hotel is ideal as either a Business or Leisure venue and offers versatile year round Bed &Breakfast accommodation for individual or group bookings. Coupled to the superb transport links and the variety of entertainment available in the immediate area it is not difficult to understand the Hotel's popularity.The hotel is also a popular venue for hosting a variety of functions. Our experienced team are happy to help our guests organise that Special occasion. We can cater for anything from Weddings through Christening/Birthday Parties to something as straight forward as a simple Business Lunch, all tailored to the needs of the individual.The Hotel is 1 hour by Road and 40 minutes by rail from either Edinburgh or Newcastle-upon-Tyne, an easy commute for Tourists/Shoppers who want to avoid city hotel prices!Call The Castle Hotel on 01289 307900 today to reserve a table or room, or for more information about Hosting your function.